The 10th edition of the Baikal Ice Running Marathon is fully booked since December 2013! From there you will receive more details about requirements, registration fee, the rules and statutes and and options for travel packages. The surface of the frozen lake Baikal is covered in fields of “hummocks”, small hills of ice rubble. Beneath the ice surface, geothermic springs and seismic activity cause localized melting that sometimes may weaken the ice to form holes ( though the average ice on Lake Baikal in this part is over 1 meter and a half which allows trucks and vehicles up to 10 ton in weight to drive on the ice). The race “Ice Captain” and his team of volunteers and the Baikal Ice Marathon support team have the task of plotting a safe course. To get well prepared for the laying of the ice course about a month and half before the Baikal Marathon the organizers of the Baikal Ice Marathon study satellite photos of the ice surface of Baikal to see how the lake freezes the current winter in order to locate possible stable ice cracks that sometimes can be up to 8 km long. A week before the Marathon we go on and lay preliminary Marathon course. The final course ( 42 km 195 m or 26 miles) is laid immediately preceding the race, otherwise movements in the ice can render the support team’s effort redundant. The course for the race of Baikal Marathon is also checked by the Emergency and Rescue Committee staff before being approved as safe to drive the vans and run on the ice. 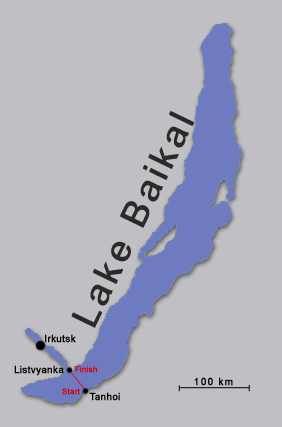 On the Baikal Ice Marathon race day itself, competitors are ferried by vans from Listvyanka to Tanhoy train station, located on the opposite shore of Lake Baikal. Prior to the start of the race, competitors some years are required to partake in the precautionary ritual of “vodka sprinkling”, in order to pacify the spirits of the Great Baikal ( introducing the novel element of starting a marathon with a shot of vodka). The course is predominantly flat, but the surface is hard at times and uneven. Although it’s mostly covered in a soft layer f snow, there’re areas of highly polished ice that create conditions similar to an ice-rink. Wind can add to the already bitingly cold temperature and provide serious resitance to progress across Lake Baikal. Though, often the weather is sunny and with no chill factor one can even get some sun tan. The utterly featureless landscape gives little or no sense of perspective to competitors. The finish line at the port of Listvyanka can be seen almost from the start line. It is a long, cold, lonely ( if not to count the mobile 8 to 10 feed and drink stands) 42,2 km trail across the baren white landscape, where progress is marked only by checkpoints positioned at 5 km intervals ( with hot drinks, food and, for the brave, some more vodka).